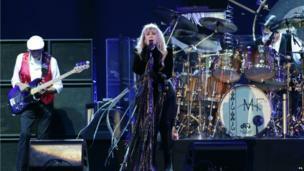 Fleetwood Mac shrug off illness to close the final night of the Isle of Wight music festival. 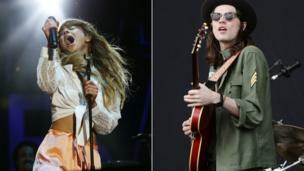 The reunited Fleetwood Mac shrugged off illness to headline Sunday night at the Isle of Wight festival over the weekend. The band postponed gigs in Birmingham Manchester earlier in the week speaking fears over whether they would appear at the event. The band opened with The Chain, from their album Rumours, and ran through hits including Dreams, Tusk, Gold Dust Woman and Don't Stop in their 20-song set. 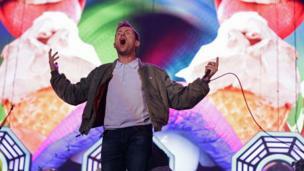 Blur also battled sickness to perform at the festival, with frontman Damon Albarn confessing he had lost his voice. But they treated fans to some of their best known hits like Parklife and Song 2 and songs from their new album Magic Whip. 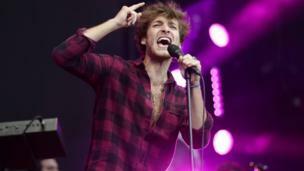 An altogether fitter and healthier Paolo Nutini delighted the crowds earlier in the day on Sunday. 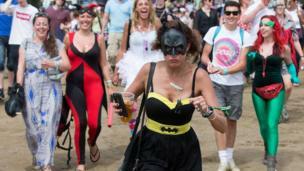 The festival attracted more than 50,000 people, most of whom got into the festival spirit in fancy dress. 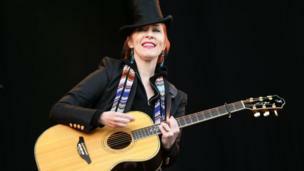 It wasn't just the fans who dressed up for the event - Suzanne Vega wore a top hat for the occasion. 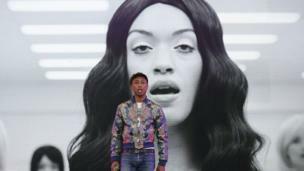 Pharrell Williams invited fans on to the stage as he performed solo material including the international mega-hit Happy, as well as older songs from his time with N*E*R*D*. He also performed some mash-ups of songs he'd written and produced, including Nelly's Hot in Herre and Kelis's Milkshake. 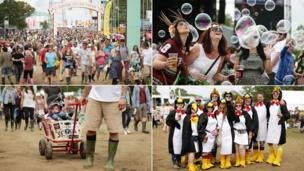 The festival is now in its 14th year since being relaunched. When it was an annual event in the late 1960s it invited artists such as Pink Floyd, Bob Dylan and Jimi Hendrix, who famously gave his last UK performance on the island. Mercury prize nominated R&B star Jessie Ware returned some love to her audience. BBC Sound of 2015 winner James Bay (right) played the majority of his debut album Chaos and the Calm; while Foxes belted out some tunes, including her new single Body Talk. This year saw an eclectic line-up across a dozen stages which included (from left-right) You Me at Six, Ella Eyre and The Black Keys. Eyre stepped in at the last minute after Jess Glynne fell ill - flying her entire band back from holiday to fill the slot. "To be fair, what an excuse to fly them back," she said.